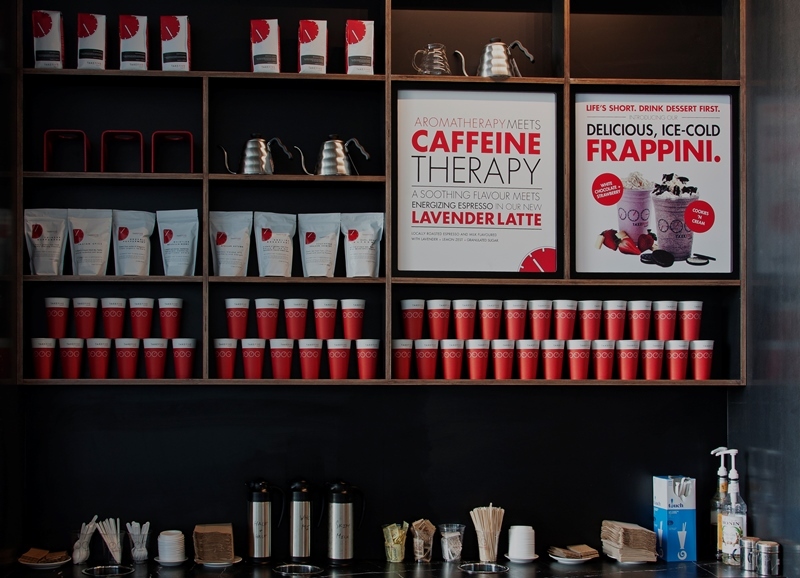 The idea of a traditional café usually brings to mind a small, cozy place with lounge seating + overstuffed chairs that dare you to try to leave. Newspapers line randomly placed tables, various packets of sugar lie artfully on display, pitchers of cream are conveniently labelled and an umbrella stand usually marks the entry. With that distinct coffee aroma lingering in the air, these memories, moments, scents, seem to mark the classic café experience. 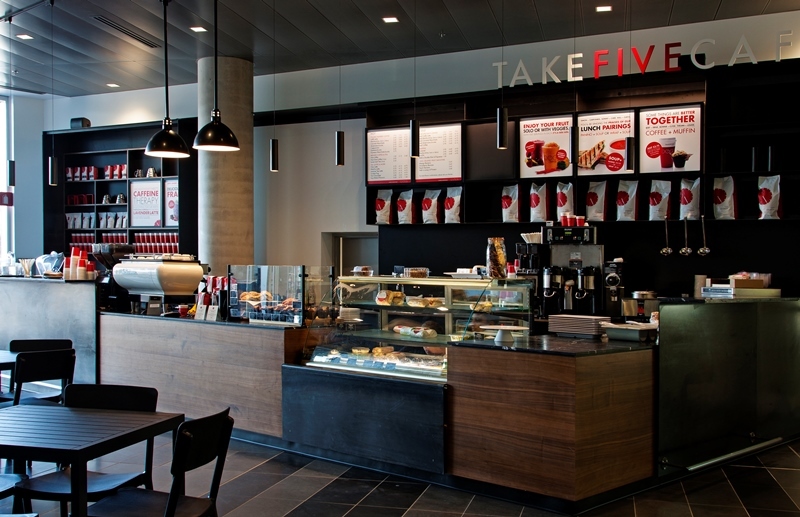 Enter 2014 and our latest location – Take Five Café Surrey City Hall. With its high ceilings and impressive industrial concrete wall, the space is modern in design yet is brimming with comfort. Functional lighting enhances the black marble top bar that is home to displays of fresh baked goods, panini and wraps. Adding to the design + sitting center stage at the bar is the La Marzocco espresso machine. Otherwise known as the Ferrari in the industry, the high quality machine is designed to look stylish yet function superbly, delivering the perfect rich cup of espresso every time. With its glossy, white finish, it pops in contrast to the sleek black marble it sits upon. And while every café space needs an espresso machine, it wouldn’t be complete without seating. At opposite end to this focal point are tables neatly arranged with stylish chairs + extra comfortable banquet seating. A round table for meetings compliments this space. Throw in sunny courtyard seating and you’ve got so many options to choose from. 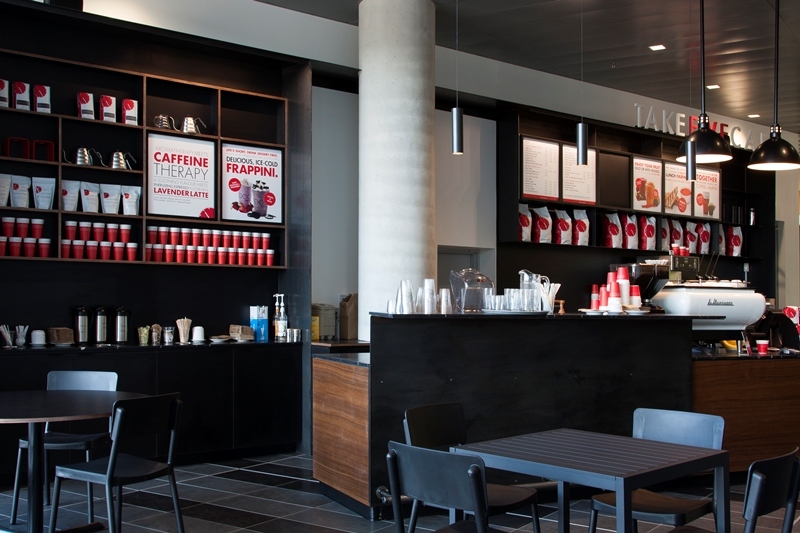 We would love to welcome you to our newest café at Surrey City Hall. Check out a few photos of the space below, and next time you’re in the area, stop by for a visit. A perfectly crafted coffee is calling your name.